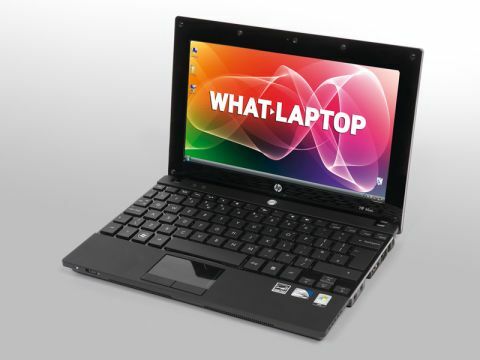 We've been impressed with several of HP's netbooks, although they've struggled to match the best machines on the market. The Mini 5101 is the latest and has a lot to offer. The conservative matt-black design is highlighted by a brushed-aluminium lid. It feels more grown up than other netbooks, but some users will find it duller as a result. The excellent keyboard spans the full width of the chassis. Each of the keys sticks up through individual holes in the chassis and have a lot of travel, making it comfortable to use over long periods. The strong chassis and soft-touch plastics hide scuffs and scratches well. There's some flex to the screen, but it's still tough enough for daily use. The screen is bright and colourful, despite the standard matt-TFT finish. Reflections and fingerprints are well suppressed in bright conditions. The 1024 x 600-pixel resolution is no better than average, but HP is also selling the 5101 at the same price through its website with a higher 1366 x 768-pixel resolution, making this model somewhat redundant. With a budget Intel Atom processor in place, performance is hobbled by Windows Vista. It can be improved by uninstalling unnecessary programs and turning the settings to basic, where it's able to run smoothly. The battery life of 198 minutes is reasonable, if unexceptional. Three USB ports offer good connectivity for your peripherals, and those wanting to connect a projector or external monitor can do so via the VGA port. Wireless connectivity is excellent, with 802.11n Wi- Fi and Bluetooth both in place. The HP Mini 5101 is a good choice for business users, with top-quality connectivity letting you keep in touch with the office when out and about. It's also comfortable, with an excellent keyboard but other models in the range are more appealing, and the price tag will be out of reach of many users.